Just thought I would check in today. We have been very busy but I think that life is going to slow down a bit now that I will have some help with my Mother that is living with us. It has been a tough road but we have survived and am so grateful we have found some proper care for her. Angelo is doing great! We still have our ups and downs but that is to be expected. He got to be the coach assistant on his brother, Jeno's football game. He was in charge of Moral. LOL!!!! 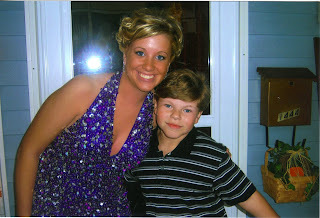 He was so cute. He would give them the pep talk before each game. They won the championship today and he got to ride with the team on Firetrucks through the whole town. We followed behind (all the parents) in our cars blowing the horn, etc.... Everyone was coming out and waving at them. I don't think either will forget this for a long time. Jeno was the captain of the team and is a great player. We are soooo proud! This last Thursday we did community service with the homeschool group. We went to the Salvation Army and help to get all the candy canes together. Angelo got a kick outta thinking he was helping Santa. 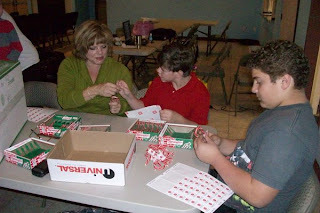 It was a long afternoon and we did close to 2000 candy canes with stickers and all. Jeno was a trooper but after about a hour Angelo started to poop out and wanted to play the drums in the chapel. Thank Goodness the people we were helping understood about the little ones and sent for Pizza. Oh, what a day for Angelo....helping Santa and getting Pizza for helping. We will be leaving to go to Disney in 2.5 weeks. Our whole family is in great need of some fun. We cannot wait! I just wanted to post and let everyone know we are still alive and well. We have been through so many changes (good and bad) this year and it seems that I never have time to breath. We moved in May to a new home. A lot more room for our expanding family. We also needed a home that My Mother would not have to go up stairs. She falls down them all the time UGH!!!!! She is starting dementia and it has been a real challenge to keep her safe and also to get her to understand what you are telling her. It is like having 4 Angelo's in one body. Needless to say, I am only 46 and am now on high blood pressure pills. LOL!!!! We are looking into some day help because she is a full time job. Angelo is doing great. Loves his new home and spends a lot of time on the trampoline. We decorated his room with fireflies. He loves how they glow and flicker. It seems to help with his anxiety also. He is now the mascot for his brothers football team. Too cute. We are planning a trip to Disney and he is too excited! Hope to post more often! Oh, my gosh...has it really been this long since I posted? Well, our family has been through so much the last few months that I am not quite sure where to start....................I guess the worse news first is that my Dad passed away a few weeks ago. It was very sudden and only a couple of weeks after being here in PA visiting us for the Christmas holiday. We all had to quickly get airline tickets and spent 2 weeks in Wyoming helping my Mom get everything together. My mother is not able to take care of herself (hasn't been able since I was 11 yrs.) and since I am the only child I have now inherited my Mother. My head is always spinning with all the added responsibility and our house has become way too small. We also now have a girl from Wyoming going to school here in Pa and staying at our home. She was just staying from Thanksgiving of 2008 til June of this year. But, now she is headed towards a degree and I guess it will be until 2010 til she moves back. LOL!!!! The poor boys are on a roll away and there is stuff everywhere. We have been looking for a new home that will fit us all but nothing seems to be out there. Hopefully with God's help the right house will appear before we all go crazy. I still need to go back to Wyoming when it gets warmer and finalize a lot of things. We still need to spread my Dad's ashes at the Grand Tetons. Weather was not permitting for us to even get near them. We have to wait until June or July. Angelo is holding up pretty good but he doesn't like to be away from his home base very long. He has an eight day limit anywhere we go. After a week he is done and wants back home and nothing will change his mind. On a good note, I signed Angelo up for dance class. I know it is a girl thing but he loves dancing so much and he really doesn't have anything that is just his to do. So, off we went yesterday for his 1st class and he had a blast. They do tap, ballet and jazz all in one class. He is so stiff! I really feel that all the stretching is going to help him. He paid attention and really tried everything that she was teaching. I have finally been able to look at emails in 6 weeks and I see that there is a lot that maybe happening with the WS people. I am hoping to get my family involved in things and not have myself a "Polly pity me party" It has just been so much and I still have not even had a chance to grieve the passing of my Dad. I keep on pushing through because I can't break down. My Mom is very "unbalanced" and Angelo is so sensitive to any emotion I have. The reality of his death has not fully hit me yet. I keep thinking my Dad is going to call me on the phone or walk through the door. I guess I am hoping that I will wake up and it was just all a bad dream. Angelo has a crush on the girl next door. Not only is she the head cheerleader of the high school she was also up for homecoming queen. When she got all dressed to get crowned, she knocked on the door to take a photo with her "favorite guy" Soooooooo cute! Oh, my! Trying to get everyone's schedules and airline tickets to coordinate is gruesome. I got one of these hair brain ideas to go see my Nana in November. It would be Me and the two boys. Well, in less than 24hrs. it has become a whole family event. It has gone from the 1st of November to the last part of November. You guessed it Thanksgiving! WHY me? do I ask? So far I got tickets for the boys & I. Then my husband did a boo-hoo and I got him a ticket. My parents are driving from Wyoming and bringing a friend of mine (who left a Mormon polygamy group. that is another long story in itself) who I had to get a return ticket to PA because she will be staying at our home for a while. But good news..............I will see all my relatives and have a Thanksgiving again like when I was young. 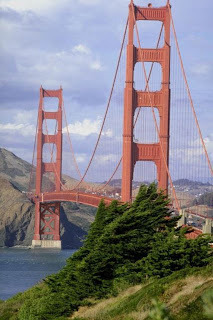 I will get to see "my" Golden Gate again! Weird how you grow up and see it all the time and take advantage. We are going to the tree lighting day after Thanksgiving on Pier 39. Yes, Angelo will have his GPS on and I do not care what anyone says or thinks, I am attaching a leash thing between him and I. One of the reasons why I left the bay area....Really scary people! Outside of SF, not so bad. But, in the city.....Oh, MY! I get to take the kids to half moon bay. We will probably freeze our hinney's off but they will get to put their feet in the sand. So, off I go to try to get this together. We have started our homeschooling year and I hope to make things a little more enjoyable this year for the boys. I feel that my older son, Jeno's schooling was too structured and Angelo's didn't have enough structure! I am going to try some different ideas this year. SO, wish me Luck! (A few prayers my way couldn't hurt either) Right now I am having the "Can't seem to get organized" and I am only a week into the school year. Yikes! I am trying to get everything in arms reach or at lest where I can find it. I am such a "curriculum junkie"I have soooooooo many useful things. But when I need them I don't know where (what box, if in attic or basement) it is. Hope by the end of the weekend (LOL) I'll have it some what together.